On the 16th (Thu), contemplate in the serene atmosphere at Scrovegni Chapel, contemplate the long history of Basilica di Sant’Antonio - Basilica del Santo, take a stroll through Cannaregio, then take in the views from Ponte dei Sospiri, and finally head off the coast to Isola di Burano. On the 17th (Fri), you'll have a packed day of sightseeing: admire the landmark architecture of Scuola Grande di San Rocco, then take in the spiritual surroundings of San Giorgio Maggiore, and then don't miss a visit to Dorsoduro. To find traveler tips, maps, ratings, and tourist information, read Venice online itinerary creator. Bangkok, Thailand to Venice is an approximately 16.5-hour combination of train and flight. The time zone difference moving from Indochina Time to Central European Time is minus 6 hours. Prepare for much colder weather when traveling from Bangkok in November: high temperatures in Venice hover around 16°C and lows are around 7°C. Finish your sightseeing early on the 18th (Sat) so you can travel to Palermo. Start off your visit on the 18th (Sat): don't miss a visit to Cattedrale di Palermo, explore the different monuments and memorials at Catacombe dei Cappuccini, and then take in the architecture and atmosphere at Duomo di Monreale. Keep things going the next day: identify plant and animal life at Riserva Naturale Orientata dello Zingaro. For traveler tips, maps, where to stay, and other tourist information, use the Palermo vacation builder. Fly from Venice to Palermo in 4.5 hours. Alternatively, you can do a combination of car and ferry; or do a combination of train and ferry. In November, Palermo is somewhat warmer than Venice - with highs of 23°C and lows of 17°C. Wrap up your sightseeing by early afternoon on the 20th (Mon) to allow enough time to travel to San Teodoro. Start off your visit on the 21st (Tue): enjoy the sand and surf at Cala Brandinchi and then tour the pleasant surroundings at Lu Impostu Beach. Keep things going the next day: stroll through Spiaggia dell' Isuledda and then tour the pleasant surroundings at La Cinta. To see photos, traveler tips, maps, and tourist information, go to the San Teodoro online itinerary creator. Traveling by combination of flight and bus from Palermo to San Teodoro takes 4.5 hours. Alternatively, you can do a combination of ferry and car. Traveling from Palermo in November, plan for a bit cooler nights in San Teodoro, with lows around 11°C. Finish your sightseeing early on the 23rd (Thu) to allow enough time to travel to Anacapri. Anacapri is a comune on the island of Capri, in the Metropolitan City of Naples, Italy. On the 23rd (Thu), cruise along Via Krupp, explore the striking landscape at I Faraglioni, and then appreciate the extensive heritage of Scala Fenicia (Phoenician Steps). 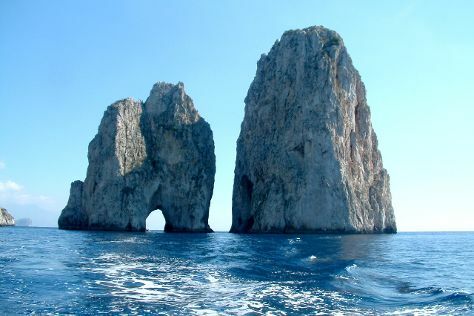 To see ratings, other places to visit, where to stay, and tourist information, refer to the Anacapri travel planner. Do a combination of bus, flight, and ferry from San Teodoro to Anacapri in 5.5 hours. Alternatively, you can do a combination of bus, ferry, and train; or do a combination of bus and ferry. Traveling from San Teodoro in November, you can expect nighttime temperatures to be somewhat warmer in Anacapri, with lows of 16°C. Wrap up your sightseeing on the 24th (Fri) to allow time to travel back home.